This simple application can refresh your current style or completely change your look. Schwarzkopf color produces high definition tones, iconic blondes, trendy fashion colors, and offers express permanent color and ammonia-free demi-permanent color. Our artists will create a custom formula and personalized color design for you by choosing select strands of hair and weaving color through them using the latest placement techniques. Whether you desire multi-dimension, peek-a-boo accent colors or natural looking sun-kissed hair, our professionals will create a tailored look just for you. Schwarzkopf BlondMe premium lighteners create unique, brilliant and iconic blondes. Our artists use this premium service to protect hair while achieving maximum brightness and color retention anywhere on the blonde spectrum, from golden honey to Marilyn Monroe platinum. This free-hand coloring technique adds rich, layered colors creating natural-looking highlights. Rather than using foils, our artistic professionals will “paint” color onto certain strands without separating them from the rest of the hair. This low maintenance color requires meticulous application from our artists. Hair fades from darker at the roots to lighter at the ends giving your hair that “summer fade” look. Ombre effects tend to be more drastic whereas the sombre look has a softer look. Not only are our professional stylists creative artists, they can also be considered hair doctors. By neutralizing unwanted tones or levels and balancing out color, our artists can repair the effects of undesirable hair color. If you ever wished your hair was more manageable, softer, smoother or had more shine, this revolutionary therapy was created for you. It reduces frizz and curl and instantly adds fabulous shine, silkiness and moisture to your hair by infusing natural keratin into the hair’s cuticle. Your hair will be much more manageable with an amazingly sleek look. Buy two TENAJ products, get a FREE stadium bag! 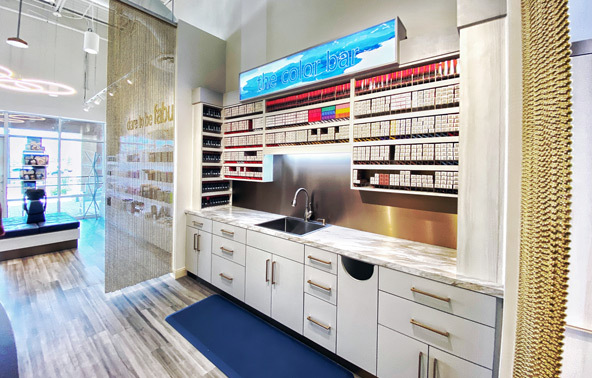 Take a tour of your favorite Salon Jaylee location!